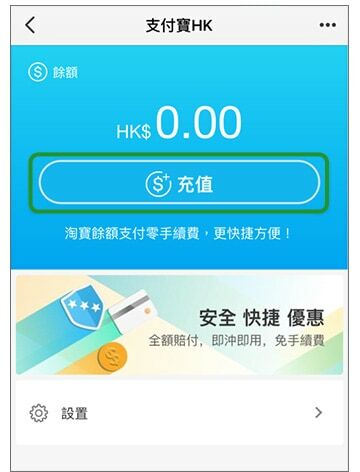 Standard Chartered is the first banking partner in Hong Kong to collaborate with AlipayHKTM allowing clients to top up their AlipayHKTM account through online or mobile banking, so they can shop and pay on Taobao or Tmall directly with Hong Kong dollars without paying any transaction fee. cards or other online payment methods. 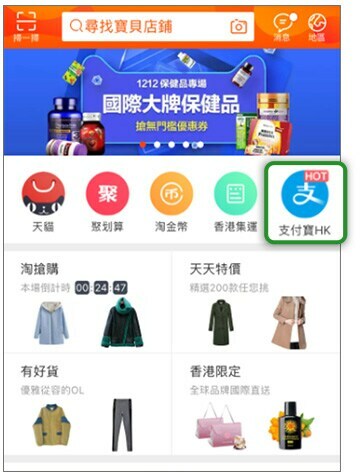 Open the Taobao App and select "支付寶HK"
Step 1: Login to Online Banking -> Click "AlipayHK Accounts" under Mobile Wallets to add AlipayHK™ Account. 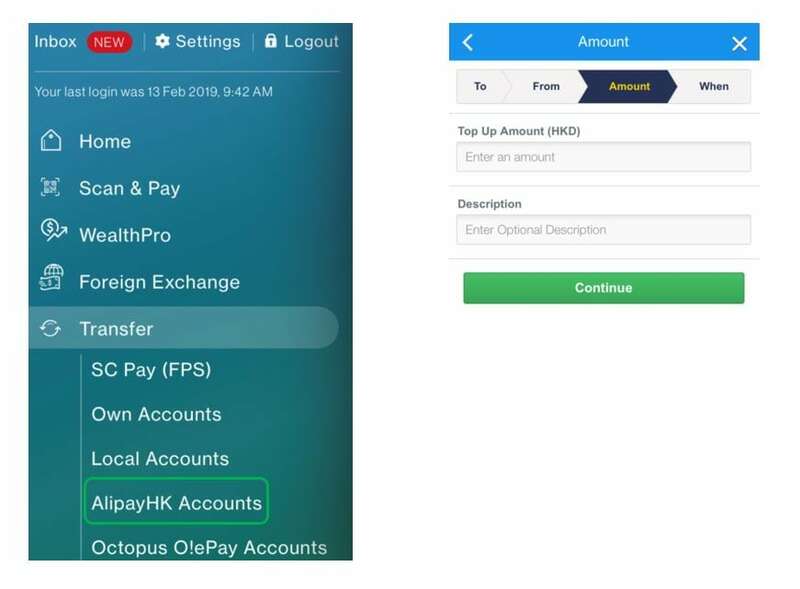 Step 1: Click "Top up"
Login to SC Mobile -> Click "AlipayHK Accounts" in the "Transfer" section, then fill in top up amount and description to proceed. The sum of money in the Alipay Account is NOT an alternative to ordinary savings or time deposits. It is NOT a protected deposit and is NOT protected under the Deposit Protection Scheme in Hong Kong. Any transfer / top up transaction from credit card(s) to the Alipay Account will not be entitled to any reward(s) earning including but not limited to 360° Rewards Point(s), bonus point(s), CashBack, mile(s). Cardholders may use electronic banking services, person to person (P2P) payment services or mobile device/app/electronic funds transfer platform effective from time-to-time to make any transfer / top up transaction from Standard Chartered / MANHATTAN Credit Card(s) to a specified account (including but not limited to Alipay Account). Effective from 25 December 2016, the maximum transfer amount in a month with the above method(s) is HK$25,000 per Cardholder, according to the Cardholder’s Hong Kong Identity Card Number or Passport Number (if applicable). 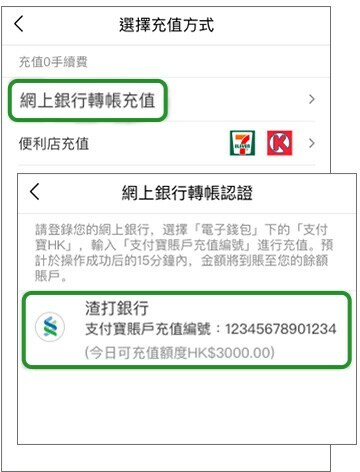 If the total accumulated money transfers made by the above methods (based on the transaction date) exceed HK$25,000 per Cardholder in a month, a 3.5% handling fee will apply to the transferred amount beyond HK$25,000 and charges will be debited to the valid Credit Card account with the highest transferred amount. If the last day of a calendar month is a Sunday, any related transactions made on that day will be counted in the following calendar month. Top up of registered Alipay account via deposit accounts are subject to the maximum daily Transfer Limit, which is the maximum daily limit for aggregated total for transfers to online registered 3rd party accounts/other local bank accounts. Please click here to view the maximum limits for online banking transactions. Top up of registered Alipay account via credit cards are subject to your respective credit card credit limit AND the maximum daily Transfer Limit, which is the maximum daily limit for aggregated total for transfers to online registered 3rd party accounts/other local bank accounts. Your Alipay account might subject to transaction limit imposed by Alipay. For further details, please check with Alipay Account. The Bank is not the provider of Alipay account and does not give any warranty over the use of Alipay account. The Bank is not responsible or liable in any manner whatsoever for any delay or failure in using Alipay account for any transaction.